A wide variety of vegetable plants are available at home improvement stores and garden centers each year. If you don't find the plant you're looking for, grab some seeds and seed starter kits to start your own. Don't be intimidated; transplanting the plants is easy–just be sure to plant them in a tilled, nutrient-rich part of your garden. Read the plant label to determine if it is a plant that must be planted in full sun or if it needs partial shade. The label will also tell you how far apart the plants should be planted. Use this information when planning where to transplant your veggies. Start hardening off your plants, especially if you've grown them from seed. To protect them from shock, they will need some exposure to the sunlight and outdoor temperatures if they have been growing indoors. Expose them to more and more light and outdoor weather each day until they can spend the whole day and night outside without harm. Prepare a portion of your garden by digging out any weeds, adding in some rich top soil. Mix composted materials or composted manure into the soil by pouring the compost on top and mixing it in with a shovel. Smooth the soil out with a rake. If planting squash, melons, pumpkins, cucumbers or other large vegetable vines, it is recommended to form 1-foot-tall hills for planting the plants in. This will help keep them well drained during rainy weather, which will prevent downy mildew and squash mold. Mix a mild solution of 1 gallon of your favorite vegetable fertilizer--organic, if preferred--according to the "weekly fertilizing" package directions. Most fertilizers have directions for weekly use that provides for a milder solution than what might be used in a sprayer, monthly or other application. If your fertilizer doesn't have a designation for weekly fertilizing, mix at half strength. If you are planning on planting several plants, you may need more than a gallon. Set your seedlings or small plants out, breaking their packages apart, if necessary–but keeping them in their planting containers–and placing them where you want to plant them. Remember to space them according to the label directions. Write the plant names on plant markers, and place them in the garden where the plants are going to be planted. Remember to note the variety of the vegetable that you are planting as you may want to experiment with different types. There are vast differences in the varieties in some vegetables, like tomatoes, peppers and beans; you will want to remember which ones you are growing and where they are planted. Dig a hole in the soil with a hand trowel, in the place where you want to plant your plant. The hole should be about 2 inches deeper and wider than the pot that is holding your plant. Cupping the plant in your hand, gently loosen the plant from the pot and remove. 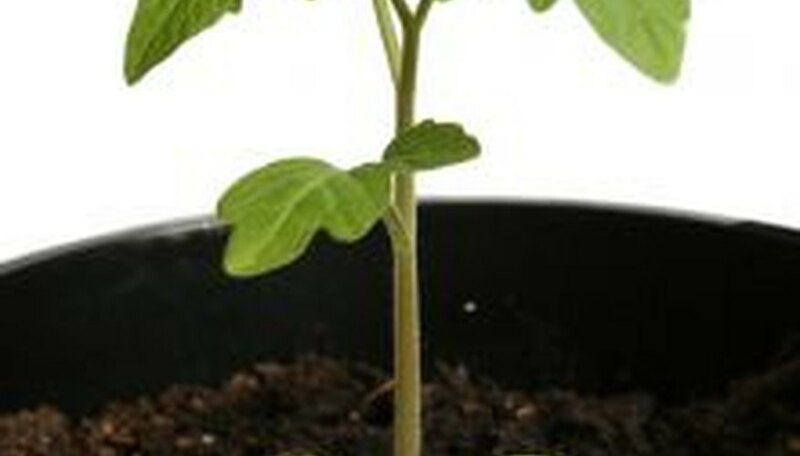 For sturdier plants, like tomatoes, you can gently support the base of the stem if need be, but for more delicate seedlings like lettuce, cup the entire plant to prevent stem breakage. If the plant is root-bound (the roots in the pot are wrapped tightly around themselves), break up the bottom of the root system slightly. If it is a peat pot, there is no need to remove the pot–just take off the plastic wrap that is on it. Break up the bottom of the pot a little bit to help the roots break through into the soil. Pour the fertilizer mixture into the hole, filling it about two-thirds of the way up. If your soil is correctly prepared, it will start to drain out before you get the plant in, but this is fine--the fertilizer is soaking into the surrounding soil and will still be able to provide nutrients to the vegetables. Place the plant into the hole and fill dirt in around it. Lightly press some of the dirt around the top of the pot to secure the plant in the hole. Continue transplanting the rest of the vegetables. Water the entire garden well with a sprinkler or light mist from a garden hose. Be careful not to spray the vegetable plants too hard with the water as this can cause breakage. Always transplant your plants on a cloudy day, late in the day after the sun is past its hottest point in the sky. This allows your plants to adjust to their new surroundings without intense heat. Be sure to set your plants out at the correct time of the season--check your USDA Hardiness Zone chart to determine when to plant each vegetable in your area. Some vegetables do not like to be transplanted, and should be sown from seeds directly into the ground. These "direct-sow" vegetables include carrots, potatoes and all other root crops, sweet peas, beans, radishes and sweet corn.